Did you know that the Nashville Children’s Theatre is the oldest continuously operating children’s theatre in the world? They were founded in 1931! We are so lucky to have this gem right in our backyard and GHPD couldn’t be more excited to announce that we are the official sponsor of their 2018-19 Open House & Season Preview Event on Saturday June 16th. The best part is that this event is FREE! The Open House is from Noon – 2 pm and it will feature numerous local family-orientated organizations and activities. We will be there too with some fun free goodies! We can’t wait to see the amazing line up for the 2018-19 season! Dr. Brittany is most excited about Disney’s The Little Mermaid. This has always been one of her favorite Disney movies and she is looking forward to seeing Nashville Children’s Theatre’s version. She is sure to be singing along in the audience. Which show are you most excited about from the 2018-19 lineup? 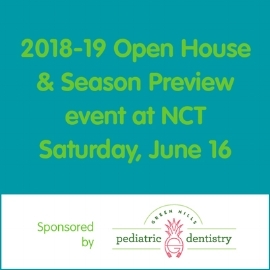 Be sure to stop by and say “Hi” to us if you are at the Open House and Preview Event on Saturday June 16th! We will be at a table with lots of free goodies to give away to all of our new friends. We hope to see you there!